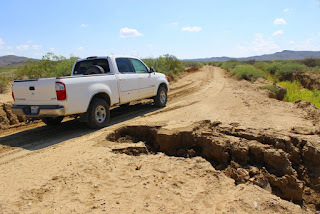 ¿Who gets to fix that, you or county road maintenance? The 2 man road crew from our "trusty" property owners association. They have 1,100 miles of dirt roads to maintain. These are all private roads so the county has nothing to do with them. Better not let them you know you've got a drone ... they'll want to borrow it! They dry out quick...not much of a problem. Sam Finn...the correct term is "rent", not borrow. Terrific discussion about the roads out there and the government that follows them, in last night's session. That is the bad washout I saw with the drone. So the road man will come with a truckload of dirt I suppose. One of my lots was surveyed but they are so busy that in two (2) years they have been too busy to do the other piece of land where the electric wires run. I would not rent out a good drone like that. One man from here who was born in Alpine went out there to visit and enjoyed every place so much. He said a lady in Terlingua told him he could buy land for $50.00 and acre. ???? I guess someone wants to lure him to buy there. that's a good sized chasm… speaking of goats, how are they? Got to be very careful driving on these roads on dark nights - with damaged roads in your path like the one shown in John's photo. And normally no one places warning markers out to warn you there is a washout halfway across the road ahead! Remember - I told you less than one half of property owners pay any road maintenance fees and they only have two men to take care of 1100 miles of dirt roads! So slow down and save a life - maybe your own? re: the road fix guys... was curious.. how do they find out which roads need attention after rains... do they have to pay someone drive around afterwards? It might be a "help" if John could email them what his roads look like ~=! Who pays the road fixers if the property owners refuse to pay? Hi, Margery. Where are your lots located? Are you planning to take on "rough living" in southwest TX? No reason to fix something if you can get by without doing anything. . . (grin). Larry G: Property owners report road conditions that need attention. It would do no good for me to report a problem because I am blacklisted by the ranch for not paying the dues (there are a number of reasons why I don't pay but we won't go into that here). They generally work my road 3 or 4 times a year because they already know what a problem it is. Only on a few occasions have I had to do a repair myself while waiting for their next visit. The ranch has more than enough suckers who pay the fees so they can pay the "road fixers". The Property Owners Association of Terlingua Ranch pulls in over a half million dollars per year. I would not mind at all if they just abolished the organization because I am perfectly capable of maintaining my road. So, therefore, I guess I am inadvertently helping John. Large G asked: "Who pays the road fixers if the property owners refuse to pay?" POATRI pays the Road Crews regardless of payment of fees by all property owners. With fewer property owners paying fees - the number of members in the Road Crew is quite a bit lower. The roads of Exempt property owners (i.e. don't have to pay any fees) and regular non paying property owners are maintained the same as regular paying property owners. They cannot not maintain a non paying property owner's stretch of road - because this might prevent paying property owners from using that bad section of road to get past that part of the road. Someone also asked about other consequences of non payment? 1) The Board picks the person counting the votes. 2) No vote counting observers are permitted. 3) Vote counting takes about three weeks (which gives POATRI plenty of time to send additional false ballots to the vote counter). These dirty tricks have enabled the POATRI Boards to control who get elected to the board, and which ballot measures are approved. Note that there were two ballots for FLAT FEES in 2005. And Property owners voted down this issue twice - but the 2005 POATRI Board simply substituted their judgement - over the ballots of the property owners. They violated the written POATRI Bylaws to do this - and this is a reason two unsuccessful lawsuits were filed against the POATRI board. In my opinion - this is not a moot issue - because the POATRI Board is still requiring payment of illegal fees! These are only a few of the obstacles that prevent property owners from obtaining FAIR FEES. Aren't there potential liability issues? If a property owner (absent or present) is content to allow public access across their lands via "common" road paths that may turn dangerous without warning, you would think a suit might result when someone drives unwittingly into such a sink hole, especially if it is a teenager or a new driver. I would think it's every owner's responsibility to upkeep any public access over their lands, and/or provide warnings of conditions, lest they face legal liability. But in this same sense, it could be that those who are paying the "maintenance fee" are giving themselves a legal defense argument with their demonstrated attempts at public responsibility. As for road upkeep, I would think individual land owners who are observant might make the best decisions about how road paths should cross their lands, so that washouts can just be skirted by altering the path to keep to higher grounds, rather then trying to mend what nature has washed away. Plains lands shift and change like the Mississippi delta, only in extremely slower motion. Rains will continually want to wash out what it washed before. So just relinquish those spots to Nature and seek to shift and find the better paths as newer circumstances arise. So, rather than try to force a road design onto a rolling plain by merely moving dirt here and there in response to erosion, it might be better to conform to Nature, as a wagon trail would, that will follow the high grounds no matter how many twists and turns. Of course you still must cross the low swales, there is no way around that, but you can choose your swales, and pick the higher ones to pave in stones or concrete so you can then use them as "low-water crossings" -- meaning you ONLY attempt them in low water because high water washes you away. And so you simply must wait out the heavy water flows, and then you have your solid crossing bed still waiting for you. Maintaining such a swale might be far easier than rebuilding high points that are continually lost. Austin had such a low-water crossing at Enfield Rd, under Mopac, back in the '80s -- may still be there. They posted the low-water-crossing warnings, but still an occasional hurried citizen or UT student tried to plunge on thru. Sometimes they made it, sometimes not. But they only suffered a dead engine and wading out of waist high water. In the desert you can suffer far more. we have private roads that are signed as "No Trespassing" , "not responsible for damage", "travel at your own risk", etc.. Typically these roads have a flock of mailboxes at the road intersection with the state road and people in cars with kids waiting for school buses when schools are in session. Not sure what UPS does.. will ask tomorrow. But Virginia is not Texas in a whole bunch of ways including the law but folks might be surprised just how many really rough backroads there are in the rural and mountainous parts. culverts or bridges have been built to allow them to go under. Tal Chai Tai - your suggestion does not work like you propose - because out of roughly 5000 property owners - fewer than 300 live on the ranch. The majority do not even live in Brewster County - and are scattered all over Texas and the USA. They therefore have no knowledge of current road conditions. POATRI - who is responsible for maintaining these roads might have some legal liability - but that would be like getting blood out of a turnip! The prudent thing to do is like I suggested - "You have got to be very careful driving these roads." I suspect quite a few property owners would be happy to restrict use of these private roads to only TERLINGUA RANCH PROPERTY OWNERS and their relatives. Because of the high percentage of nonresident property owners - many thieves use these lonely private roads to poach our wildlife, steal our rocks, and harvest our cactus plants from our private property. That is exactly why 99 percent of the local ranchers have their private property roads gated off. Local law enforcement is stretched pretty thin - in this largest county in Texas and can not control these issues.